We’re all for planking your way to a stronger core. And odds are you have a handful of go-to bodyweight abs exercises that you do on the mat when you’re cooling down. But if you’ve ever wondered how you can work your abs with the equipment available at your gym, we’ve got you covered with 17 creative and effective ways to take your abs routine up a notch. Killer core moves using some of the most common gym equipment: a pull-up bar, cable machine, Bosu ball, abs roller, TRX straps, and barbell. You can adjust them to fit any fitness level. Next time you’re at the gym (and dread doing another crunch), pick three of the moves below and do 2 to 3 sets for the recommended number of reps. Stick to it, and we promise you’ll feel the burn—and see results. Engaging core and keeping legs straight, draw a big circle in the air with feet. Be sure to brace your abs tight so your body doesn’t swing back and forth. One circle in each direction equals 1 rep.
Do 8 to 10 reps.
Make it easier: Work up to the pull-up bar by doing the move in a captain’s chair first, which will provide more stability. This one may look like you’re running in the air, but hey, it works. Grip a pull-up bar with palms parallel, arms extended. Engage core and pull knees up to a 90-degree angle, thighs parallel to the ground. From here, pedal your flexed feet as if riding a bicycle. Repeat as quickly as possible while maintaining control for 30 seconds. Grip a pull-up bar. Engage core and lift knees toward the right side of torso, allowing legs to bend naturally. Pull knees as close to right side of chest as possible, then slowly lower back to starting position. Repeat by pulling knees to left side of chest. Completing both the right and left sides counts as 1 rep.
Make it easier: Draw both legs straight up to the centre of chest. 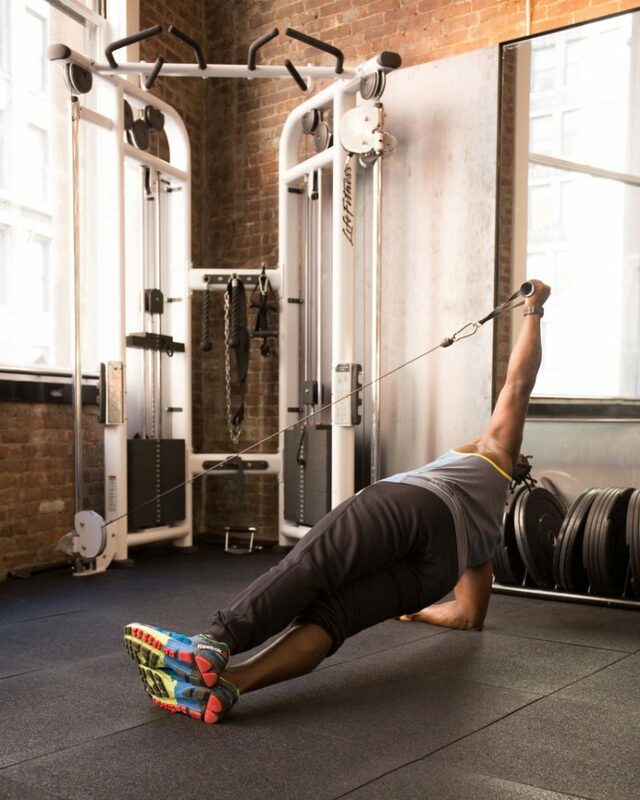 Don’t let the cable machine intimidate you—it’s easier to use than you think. Stack on a light weight (start with 10 pounds or fewer) and position the carriage so it’s even with chest. Stand next to machine, left side facing away from machine. Hold one cable handle with both hands, then take one big step away from the machine. Extend both arms fully at chest-height, come into a comfortable half-squat, and hold the weight steady. Engage abs to hold the handle straight in front of body—don’t twist body toward the machine. Stack a medium weight onto the cable machine and slide the carriage down to setting close to the ground. Standing with your right side perpendicular to the machine, take hold of the cable handle with your right hand. Place left hand behind head. Engage obliques and lean to the left, away from the machine, performing a standing side crunch. Do 10 to 15 reps, then repeat on the other side. As long as you’ve mastered a bodyweight side plank, you’re good to go on this one. Load a light weight onto the cable machine, slide the carriage down to a low setting, and position yourself a few feet from the machine. Take cable handle in left hand and come into a side plank on right forearm, bracing core and stacking feet. Extend left arm so body forms a T shape. Hold for 30 seconds, then repeat on the other side. Related article: When Is The Best Time To Train Your Abs? Load a light weight onto the cable machine and slide the carriage down to a low setting close to the floor. 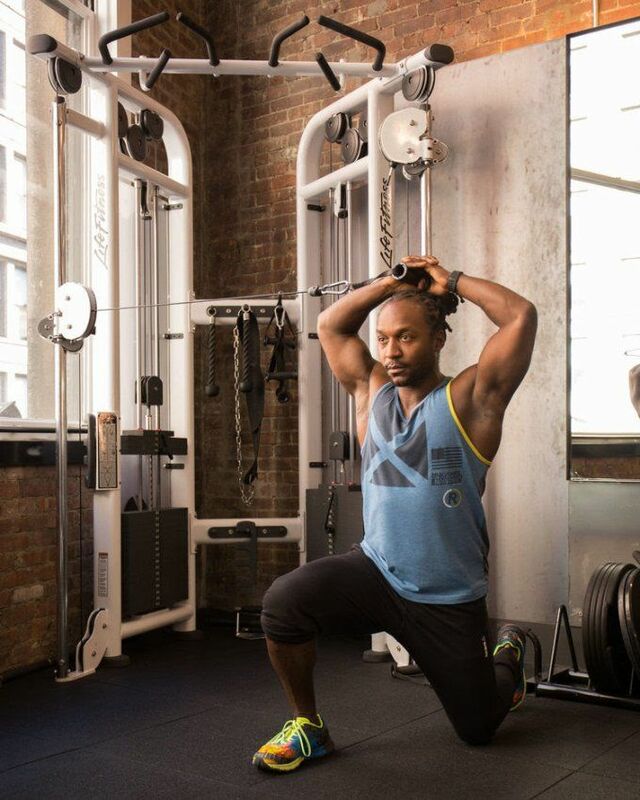 Start with right side of your body facing the machine, right foot and left knee on the floor. Hold the cable handle in both hands and pull the handle overhead, using hands to hold the cable in place on top of head. The goal is to stay perfectly straight (don’t lean toward the machine), with core engaged. Hold for 30 seconds, then repeat on the other side (with left side closer to machine). Place the Bosu ball bubble side down. Start in a plank position, gripping the edges of the flat side of the ball. Bring right knee in toward left elbow, then left knee in toward right elbow (like mountain climbers). Repeat, running legs to opposite elbows as quickly as possible for 30 seconds. Make it easier: Run legs straight in toward chest, instead of to opposite elbows. Place the Bosu ball flat side down. 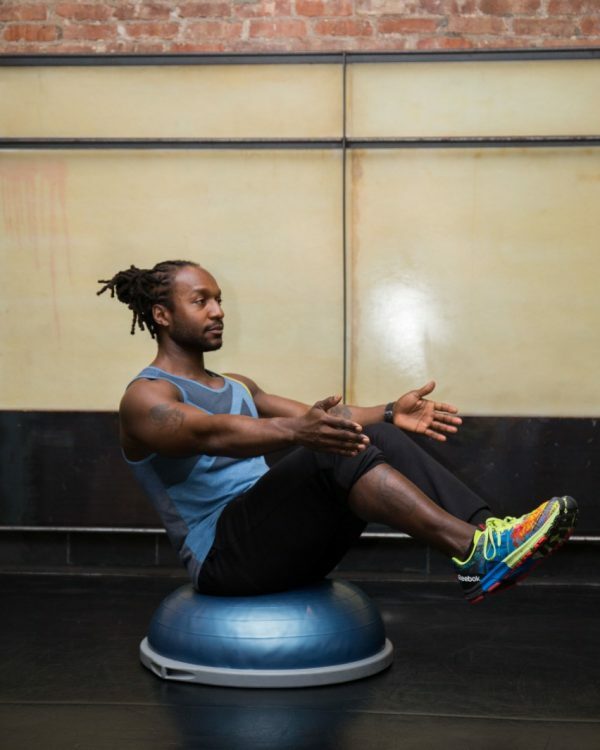 Sit on the centre of the bubble side, knees together and bent, core engaged, back straight, and feet on the ground. Once you have your balance, slowly lift feet off the ground and lean back slightly to keep balanced. Raise arms straight at your sides so body forms a V shape. Rest right hip on ball, legs extended straight. Crunch up to the left, engaging obliques and using your whole core to help stabilise. Think about bringing left elbow to left hip in order to engage obliques. Do 10 to 12 reps, then repeat on other side. 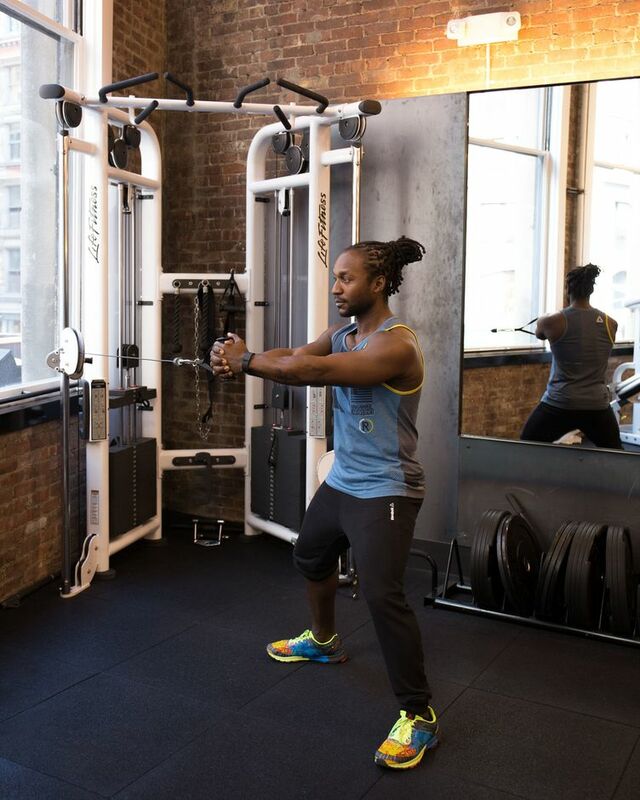 If you’ve never tried this piece of equipment, you’re in for a treat—it’s actually fun to use. Kneel on mat with knees hip-width apart. Grip handles of abs roller and roll forward, engaging core. As you come forward, rotate the abs roller toward the right in an arch, so you engage obliques. Roll out as far as you can without letting hips fall to floor or without hiking hips. Slowly roll back to start position and roll out again, this time arching to the left. One roll to each side counts as 1 rep.
Do 10 to 12 reps.
Place TRX straps at waist height. Stand facing TRX with feet a little wider than hip-width apart. Hold both handles, making a fist around the handles. Take a few steps back, and lean away from the straps so that arms are fully extended, core engaged. Keeping arms straight, pull yourself toward the straps, driving hands to the right. Return to starting position, then repeat, this time driving hands to the left. Repeat for 10 to 12 reps.
Make it easier or harder: Walk feet away from the straps (so your body is at less of an angle) for less of a challenge. Or for more of a challenge, walk feet toward the straps (so your body is at more of an angle). Lower TRX straps so the bottom of the strap falls just below knees. Kneel on the ground facing away from the straps. Carefully place each foot into a strap and get into a high plank position so that your weight is supported by hands and feet are suspended off the ground in straps. Squeeze thighs to keep feet close together. Engage core and pull both knees in toward right elbow. Return to starting position, then repeat, pulling both knees toward left elbow. Make it easier: Pull in one knee at a time straight to your chest. Start in same high plank position. Slowly release and return to starting position. Note: These moves are ideal for the intermediate or advanced fitness fan. You can use either a barbell (with weight, as shown, or without if you’re not quite at Liles’s level) or a weighted body bar. Make any of the below moves easier by eliminating equipment entirely. Lie face-up and hold barbell overhead with arms fully extended, hands shoulder-width apart. Aim to tap toes to right hand, then slowly lower feet back to ground. Make it easier: Lose the barbell and extend arms straight up, trying to tap both toes to hands. You’ll need an incline bench for this move. Lie face-up on bench and hook feet under foot holds. Take hold of the barbell (keep it handy!) and extend it overhead with straight arms, hands shoulder-width apart. Perform a sit-up, so bar is extended overhead, biceps are inline with ears, and back is straight. Slowly lower and return to starting position. Do 8 to 10 reps with a heavier weight or 10 to 12 with a lighter weight. Make it easier: Perform sit-ups on the incline bench without barbell. Work on raising arms overhead as you sit up in order to prepare for the next step. Start in the same position as above. Sit up halfway, so core is engaged, then slowly lower the barbell so it’s in front of your chest. With core engaged, perform a chest press by pushing the bar out in front of chest. Slowly lower bar to chest. Repeat chest press 8 to 10 reps, then lower back to starting position. Make it easier: Just practice sitting up halfway and extending arms in a chest-press motion without weight.